1. 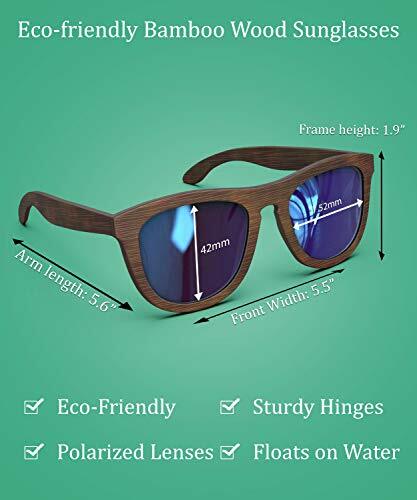 Excellent Craftsmanship: Premium quality, eco-friendly, unisex sunglasses made from 100% bamboo - making them simultaneously lightweight and incredibly durable. 2. Classic Style with Unique Touches: Wayfarer style frames with uniquely designed keyhole shape nose piece (helps keep them from slipping down your nose). 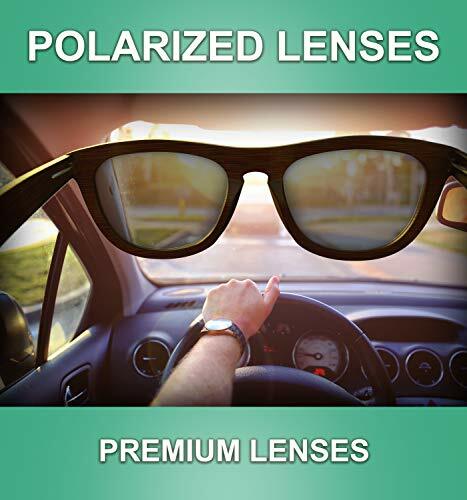 i. Polarized Lenses: Neutralizes glare from the sun allowing you to see more clearly regardless of the brightness of the sun and reflections. 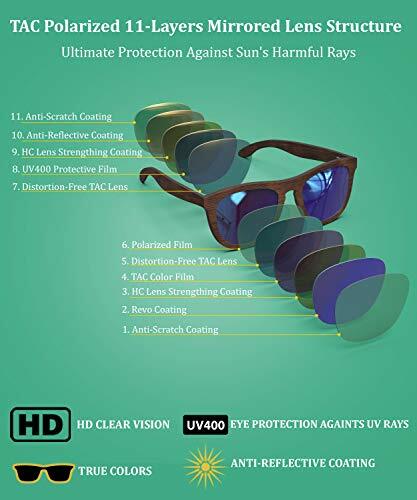 Polarized lenses also help reduce the harmful effects of UV light. ii. Double-Hinge Frames: Keeps the sunglasses snug in place regardless of your face size and shape. Double-hinged also helps prevent damage to the frame from bending by allowing the arms of the frame to hyperextend about 15 degrees. iii. Floats on the Water: Never lose your glasses in the water again when swimming, boating or any engaging in any other water activity. -FREE Bamboo Case: 100% top-quality bamboo case included. -Eco-Friendly: At Wise Owl, we strive to make the best quality products from renewable resources. Bamboo is one of the most environmentally friendly materials in the world. 10% of proceeds are donated to the National Resource Defense Council (NRDC). -Guaranteed Quality: We are extremely confident that you will love your new sunglasses. If you are not happy with the product in any way, we will make it right by giving you a full refund, no questions asked.